The British troops landing at Gold Beach on D-Day had a special mission: clear the way for the supply lifeline that would fuel the Allied advance into Europe. The Gold Beach of the D-Day Normandy landings, between Ver-sur-Mer and Arromanches, 10 km (6 miles) northeast of Bayeux (map), had a special mission: to clear the way for the quick construction of the crucial artificial port of so-called Mulberry docks so that the vast Allied invasion force could be reliably supplied with all the arms, ammunition, equipment, food and transport needed. German resistance was strong at several points along the beach, but the British forces pressed on and neutralized the defense by mid-morning. By the evening Arromanches had been captured by the British, and the engineers could begin construction of Port Churchill, an artificial port made of huge concrete docks called Mulberries, which had been floated across the Channel from England. As all of the ports in the German Atlantic Wall around Europe were heavily defended, the daring and untried plan of building an artificial port from scratch was attempted, and successful. Soon Port Churchill was supplying the thousands of tons of supplies required daily by the huge Allied military effort. Today Arromanches is an attractive and popular seaside resort town of picturesque hotels, beachfront restaurants, and wide beaches. Remains of the concrete Mulberry docks are still easily visible, and reachable on foot across the beach at low tide. 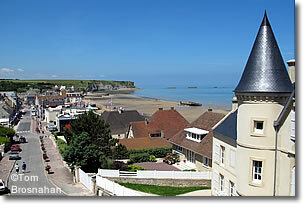 View of Arromanches, a popular seaside resort.